I’m not sure that Sklansky is right though. The assumption is that exploitation is a poker skill that can only be employed temporarily before the opponents will catch on and reduce the edge. A new game would allow new exploitation and for a short amount of time the better Poker player would adapt quicker. I don’t think this has to follow. To pull an example from a different domain: if Lebron James and I (played basketball in high school but not much since) started playing Soccer or Bowling, sports that presumably we had no experience with, Lebron’s edge would be considerably weakened. This is because Lebron is a specialist and his athletic gifts have less marginal utility in new games then they do in basketball. This may apply in the NFL, whereby a new ruleset could make previous skills worth less and different skills worth more. 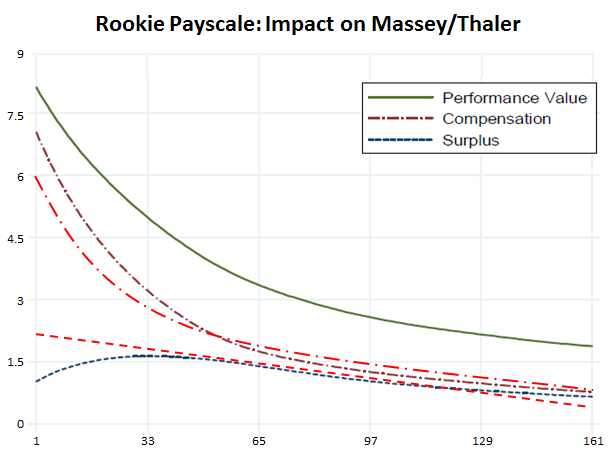 in fact, if the true value of picks are the same from round by round once their salary has been factored in, other skills like player evaluation and fit become more important then finding other GMs to fleece, for example. This is great stuff. I have always thought it in my head but haven’t seen it broken down so cleanly. I love this. Check out my Patriots blog, I have linked to this article. Pats weren’t the only ones who engaged in draft optimization strategies; it’s pretty clear the Eagles did as well. Further, the Pats weren’t the only ones trading up in 2012. There were eight teams that traded up in 2012. It appears to have been a league wide notion that with relatively less expensive first round draft choices, it was okay to trade up for talent in the first round. 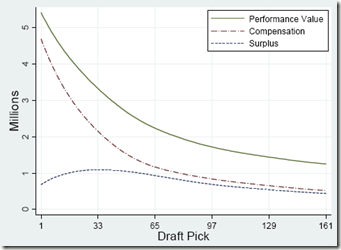 I would be very curious if the correlation I found between draft choices and winning goes away as the conditions that led to overvaluation of first rounders decreases. 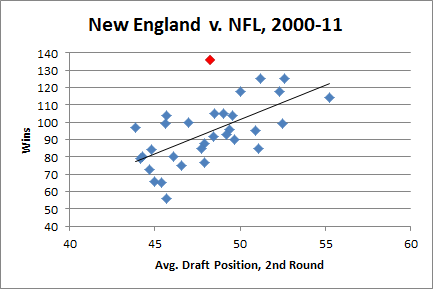 In the long run, I think changing the system to make it align more with the conventional wisdom that the Patriots (et al) have been exploiting will reduce their drafting edge, for sure. But the Pats apparent adjustment this year makes it even more clear that their exploitation was intentional. I know this is an old post, but I just can’t believe how much people minimize the impact of an all-time great QB like Brady. With the many rules in today’s NFL that favor the passing game, a great QB is so much more valuable than even his on-field performance. Brady’s effectiveness means that the Patriots do not have to worry so much about finding great players at other skill positions, something even a team with a merely good QB like the Cowboys must worry about. With this freedom, the Patriots are able to play the percentages, make low-risk investments (Gronkowski, Hernandez, Talib, Revis) and stockpile enough servicaeble to good players (Edelman, etc.) to keep the train running. A team with a giant hole at QB (The Texans), or a team stuck with a pretty good but not great QB (The Lions) can’t just sit back and stockpile value picks. They need several impact players at other positions to make up the deficiency at QB or else they will struggle to make the playoffs and their coaches and GM’s will eventually be fired. « Is Randy Moss the Greatest?